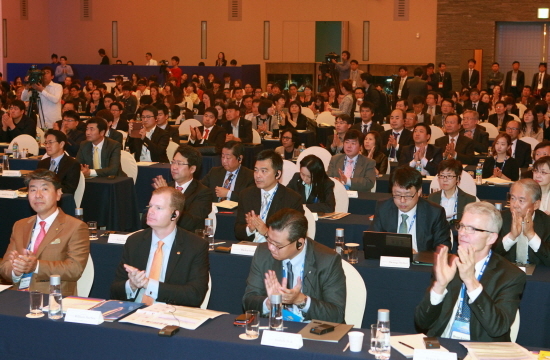 The ACLN (Asia Cruise Leaders Network) held its inaugural annual conference on Wednesday, Aug. 17, during the 2014 Asia Cruise Forum Jeju. The network was the first of its kind and is working to ensure the sustainable and stable growth of the industry in the region. The network had been called for due to the drastic growth in cruise tourism since the late-2000s as governments have realized the benefits of the industry to local economies. The need to coordinate growth systematically led Jeju Special Self-Governing Province to propose the cooperative network of cruise industry leaders whose members include cruise companies across the region in addition to academics and policy makers. The network was borne of the Jeju Declaration which sought to steer Asian cruising on its path toward global success. Cruise companies and industry leaders realize the need to strategically manage the rapid growth seen in the Asian region and it is hoped the ACLN can add value to both Jeju and the regional cruise industry. At the meeting on Aug. 27, around 30 representatives of cruise-related organizations, including many representatives who signed the original Jeju Declaration, developed plans including recruit new members and establishing a foundation for future interchange and cooperation. The network meeting was hosted by Jeju Special Self-Governing Province and attendees included regular ACLN members plus invited guests. more active exchanges in the area of Asian marine tourism and to the vitalization of regional economy. 2. Based on our deep common understanding and cooperation on that necessity, we launch the "Asia Cruise Leaders Network" as a mutual cooperative consultative body for the sustainable growth of Asian cruise tourism. 3. Based on the "Asia Cruise Leaders Network" members' mutual understanding and respect, the body facilitates its members' joint efforts to expand cruise tourism markets and to build stronger receptivity environment. Through such efforts we contribute to the promotion of the Asian cruise industry and the members' common prosperity. 4. To this end, the secretariat of the "Asia Cruise Leaders Network" has its office in Jeju Special Self-Governing Province ensuring supports for the stable and efficient operation of the organization.